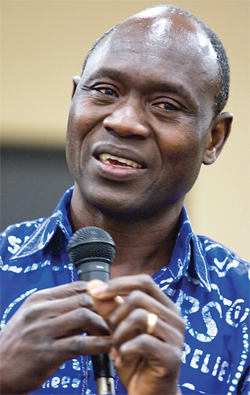 Thomas Awiapo faced bleak poverty and hunger growing up in his village in Ghana. Because of aid from Catholic Relief Services, he survived, and he will share his story of perseverance and success over a simple meal Wednesday, April 9 from 6:30 to 8:30 p.m. at St. Charles Borromeo Seminary. The free event in the Eakins Room of the seminary college building shines a light on CRS Rice Bowl, a nationwide effort administered by Catholic Relief Services to alleviate hunger locally and abroad through four components: prayer, fasting, learning and giving. The Archdiocese of Philadelphia is participating in CRS Rice Bowl for the 39th consecutive year during Lent. The event is sponsored by Catholic Relief Services of the Northeast/Mid-Atlantic Region, archdiocesan Nutritional Development Services, Office for Pastoral Care for Migrants of Refugees, Office for the New Evangelization and St. Charles Borromeo Seminary. The seminary is located at 100 East Wynnewood Road, Wynnewood. For more information on CRS Rice Bowl contact Anne H. Ayella at 267-262-8901, or visit Catholic Relief Services’ website.